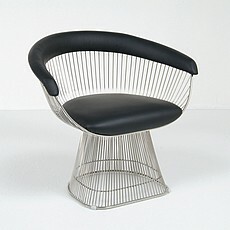 Joseph Warren Platner was born in Baltimore on June 18, 1919, and graduated from Cornell University with a degree in architecture in 1941. He received the Rome Prize in architecture in 1955, and was inducted into Interior Design magazine's hall of fame in 1985. 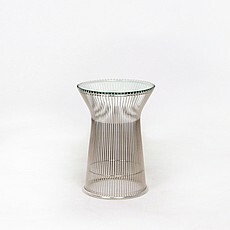 Mr. Platner, who worked in the firms of Eero Saarinen and Kevin Roche in the early and mid-1960's, introduced his collection of chairs, ottomans and tables in 1966. 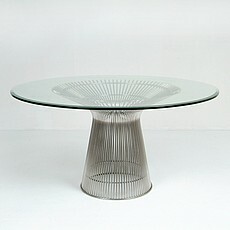 Known as the "Platner Collection", each piece rests on a sculptural base of nickel-plated steel rods resembling a shiny sheaf of wheat. 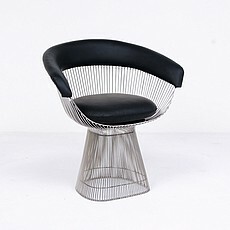 Platner designed both the structure and the production method for these designs, forming his primary contribution to the mid-century modern furniture movement and is still an enduring icon of 1960's Modernism. Dimensions (in): 54w x 54d x 28.5h. Dimensions (in): 34w x 34d x 27h. 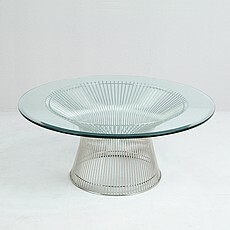 Dimensions (in): 36w x 36d x 15.5h. Dimensions (in): 14.5w x 14.5d x 20h. Dimensions (in): 27w x 22d x 29h; Seat Interior: 21w x 18d; Seat Height: 17.5h. Dimensions (in): 36.5w x 25.5d x 30.3h; Seat Interior: 21w x 18d; Seat Height: 17.5h.